Rilakkuma which literally means Relax (Rilak) and Bear (Kuma), is a character by San-X and first appeared in year 2003 on a comic book called Rilakkuma Seikatsu (Life of Rilakkuma). It quickly become a big hit because of it's relaxing, lazing around cuteness and has become a big hit since then. And now, I can't believe that I'm invited to Butterfly Project x Canon's Around The World with Rilakkuma & Canon event, and of course I can't wait to have a look at the Canon EOS M10 x Rilakkuma Collaboration set. The event's dress code is Travel and it took me quite some time to figure out what I'm gonna wear that day because my travel style are usually comfy and casual. Lucky me I bought a Rilakkuma raincoat during my last Bangkok trip and I was like, rainy days is a part of travel weather too sometimes so why not? Never once I step into an event venue with big wide smile like that day. Seeing all the Rilakkuma plushies sitting around the chairs, colourful balloons everywhere, I'm literally in Rilakkuma wonderland. Canon has decided to take travel and adventure to another level by jumping into Nui-Dori's bandwagon. Nui-Dori means Toy-Travel is a recent hype where you bring your toy to travel with you and include the toy in travel pic. And with the collaboration with Rilakkuma, Canon's Special Edition EOS M10 Box set comes with a limited edition 24cm Rilakkuma plush toy and is officially Canon's next travelling companion. I almost cried when I saw it walking out from backstage. I never thought I would be able to see life-size Rilakkuma walking around, waving, doing some silly dancing moves in my life. At least not when I'm at Malaysia and not Japan. I try so hard to calm down and not to cry, it is one of the precious, touching moment in my life and I gotta thank Canon Malaysia for this! Let's practice Nui-Dori on the spot shall we? Rilakkuma and his Canon EOS M10 at a cafe while sipping coconut juice. Another highlight moment of the event were the lucky draw and best dress contest. Too bad I didn't get to win in lucky draw which the grand prize is the Limited Edition Rilakkuma x Canon EOS M10 bundled kit, but still I won a prize in the best dress contest and got myself a big Rilakkuma plushie! 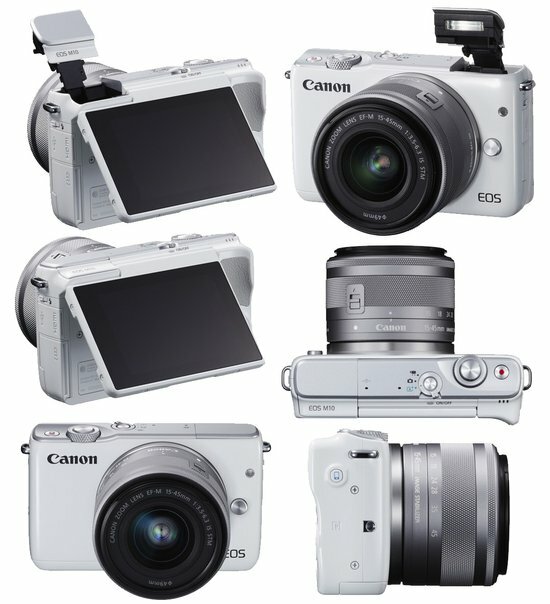 The EOS M10 is the latest addition to canon's EOS M ranged of high performance mirrorless interchangeable-lens camera. It is the most compact and lightweight in the series, this camera is the camera you want to bring to travel and experience the adventures in life without missing any beautiful moment capturing opportunity. Can we go travel around the world together someday? What's more happier than having everything you love in one picture? 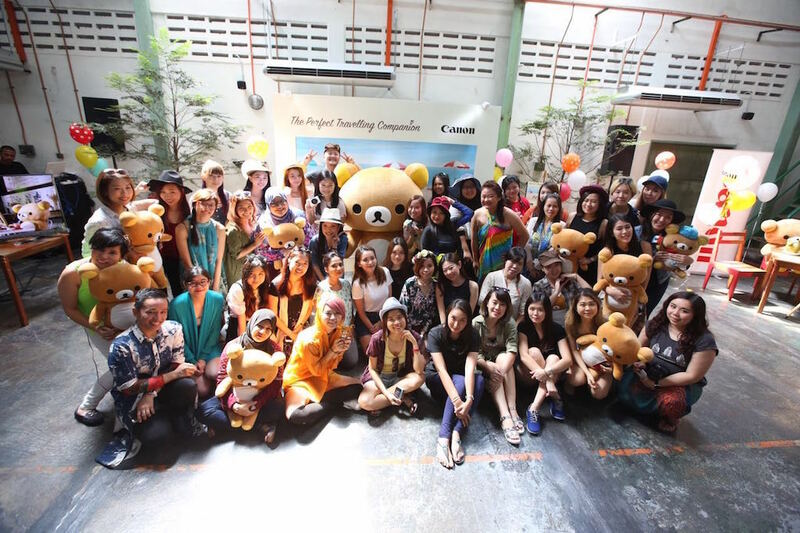 Now you can take part in Canon's #ToyTravel photo challenge and for 3 months consecutively with 3 3 different themes, 3 winners from each theme will be chosen and they will walk away with Canon EOS M10 kit (EF-M14-45mm) along with 24cm Rilakkuma plush toy. The 1st theme was announced on 6th of June which the theme is "Food", I'm anticipating the next two themes for the coming two months.